General Manager Jerome Stubert (center) of Novotel Ambassador Gangnam poses with his staff at his hotel in Seoul. 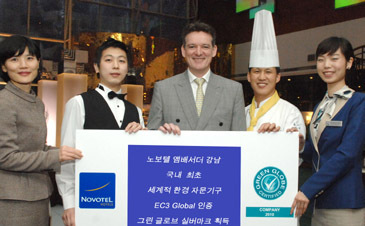 As of Feb. 2, 2010, Novotel Ambassador Gangnam officially acquired “Green Globe Silver Mark” certified by EC3 Global, a global environmental advisory organization. Green Globe is a worldwide certification system for sustainable development to pursue low carbon growth in future. The certification is managed and operated by EC3 Global, headquartered in Brisbane in Australia. To acquire the certificate, worldwide business entities such as international tourist hotels and resorts or airlines are actively engaged in various environmental campaigns. The applied criteria of campaigns include eco-friendly products, saving water and energy, garbage recycle (referred to ‘Environmental Indicator’) and support for the community where their businesses are done (referred to ‘Social Indicator’). The Green Globe certificates begin from Bronze (benchmarking stage) and move up to Silver, Gold and Platinum. EC3 Global was established in 1994 by The World Travel and Tourism Council as agreement on the Agenda 21 at the Earth Summit in Rio in 1992. Novotel, an Accor chain hotel brand, operating over 400 hotels and resorts in 58 countries, has pursued sustainable development under the guidelines of Green Globe as part of brand policy, specifically engaged in ‘Accor Earth Guest Program’ embarked 10 years ago as part of environmental management. As a Novotel chain hotel, Novotel Ambassador Gangnam has started its mission on the environmental management several years ago. Efforts of the hotel include environmental campaigns such as taking care of riverside flowerbeds, planting trees and cleaning rivers. Also the hotel has supported various charity events and implemented eco-friendly policies in its hotel operation. As a result of above efforts, Novotel Ambassador Gangnam became the first hotel in Korea to acquire Green Globe Silver Mark which followed it’s Bronze Mark in March 2009. Currently Grand Intercontinental and COEX Intercontinental Hotel are the only hotels with Bronze Mark. “The perception on corporate social responsibility and environmental management is becoming common among worldwide leading corporations. It’s definitely an honor for our hotel to become the first hotel in the nation with the globally authorized certificate. We will continue our effort and systemize our environmental management to move to the next level up” firmly said the general manager of Novotel Ambassador Gangnam, Jerome Stubert.